Maximum size: about 100 mm. Identification: The body of this species ranges from pale yellow to orange-tan with paler blotches near the gills and rhinophores. It is smooth with wide, flaring margins that can have many folds and there are two main constrictions, one near the middle of the body and one behind the gills. The mantle margin has a thin red line with a white submarginal band. The gills are translucent with orange and white edges and are vibrated. The rhinophores have red lines on their posterior margins and white lines on their anterior margins. 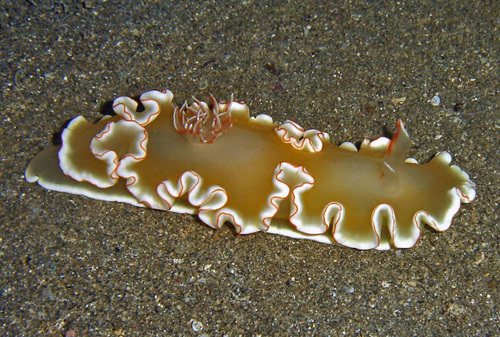 Natural history: Ardeadoris sp. #2 is a rare species known from only six animals found in (or near) rocky/rubble areas at depths of 14-45 m (45-148 ft). Distribution: Maui and Oahu: may also be known from the Philippines and Solomon Islands. Taxonomic notes: This species was listed as Thorunna nivalis in Bertsch and Johnson, 1981. It was first recorded in Hawaii from Makaha, Oahu by Scott Johnson on Sept. 13, 1979. It may be the same as "Ardeodoris sp. 1" from the Solomon Islands as illustrated in Gosliner, et. al., 2015. Photo: PF: 75 mm; right rhinophore regenerating: found by Warren Blum; St. Anthony wreck, Kihei, Maui; Jan. 2, 2017.